The downturn in the economy significantly increased our applicant numbers. As a result, we are experiencing a high volume of applications which is resulting in longer processing times. We apologize for any inconvenience and ask that you remain patient. We have two classes of 70 cadets each scheduled to begin on March 21, 2011, and May 23, 2011. If you are interested in applying, you should do so as soon as possible to increase your chance of being in the applicant pool for these classes. If you have already applied and have not been contacted for an interview, please note that you do not need to reapply since your application is awaiting processing. 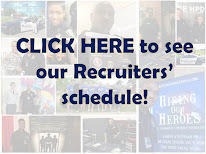 Please check back at: www.hpdcareer.com www.hpdblog.com or visit HPD at Facebook at www.facebook.com/houstonpolice for updated information on applicant processing. If you have any additional questions, please contact HPD Recruiting at 713-308-1300 or 800-252-0473. This blog is great! Thanks for your hard work on it. Is it possible to apply before you have all of the 60 college credits to get a head start on the application process? Thanks! I applied awhile back and it was an out of state app. I have now moved to the area and was wondering if there is anything i can do to get into the classes next year. Write me an email at officermccoy@gmail.com and let me see what your status is on your application. Is it possible for someone to join this unit, without having any police officer experience. You do not need police experience to apply. I just turned in my application and I have my fingers crossed for a response! This is a great blog btw. Officer McCoy are there any slots open for the 2011 classes? The slots are not filled. How long does the probationary period last? One year from your first day in the police academy. You do not need experience just college hours correct? College hours a must? Once you receive your call to come in for an interview, you will be able to update your information. Everyone who meets the mq's will have an opportunity. IT WAS AN HONOR TO BE IN YOUR PRESENTS OCTOBER 6, 2010. 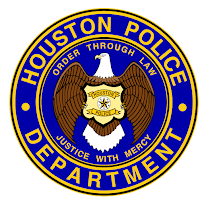 I AM STILL INTERESTED IN JOINING THE HOUSTON POLICE DEPARTMENT. I WANT TO KNOW WHAT ARE OTHER WAYS OR TECHINIQUE I CAN USE TO LOSE 10LBS BY MAY? Is commercial dive experience preferred? I am a PADI certified Instructor (which includes search, recovery, and rescue) and am curious about either applying for employment or volunteer opportunities. When I originally filled out my application I was out of state, but have recently moved to the Houston area. I read on another post though that out of state applications are not being considered. Should I resubmit, or is there someone I should talk to about amending my application? Your help is greatly appreciated. You should call 713-308-1300 and update your application. Make sure you tell them that you are now local. If it has been over one year you should re-apply. How long should I expect to wait to hear some sort of response? I am trying to be patient but it is difficult. I suggest that you call 713-308-1300 and ask for an update. They should be able to give you some sort of time frame. This website and blog is very informative. I wanted to know that for those of us with college degrees; How does the incentive pay work? Do you receive it every pay check? Is it a one time thing? I have no knowledge and would like clarification. Thank you for help in advance. Are there still spots available for the March academy? There are very few spots left for the March class and still numerous spots left for the May class at this time. You will receive your college incentive pay bi-weekly in included in your paycheck. Thanks Weston. Great meeting you last night. Hello Officer McCoy. I'm currently in the HCCS Police Academy and looking forward to joining HPD for the next available class. I've already completed my application and the following interviews/exams and am now just waiting for a final response.I just wanted to tell you this blog is a great idea, I've followed it for a year now and can't wait to hopefully one day be mentioned here. I applied and got called for my pre-screening interview last week. I was under the impression the call back would take longer and unfortunately have not met the height and weight requirement. I let the woman know that but she encouraged me to still show up. I know those guidelines are pretty strict, so I was wondering what you would suggest I do in this situation? I encourage you to attend to find out if you meet ALL the criteria. This way, if you know that it is only weight, you will know how to proceed.